Today we’re giving you tips on building an impressive health-forward snack board that is packed with flavour and will please all of the palates at your dinner table. 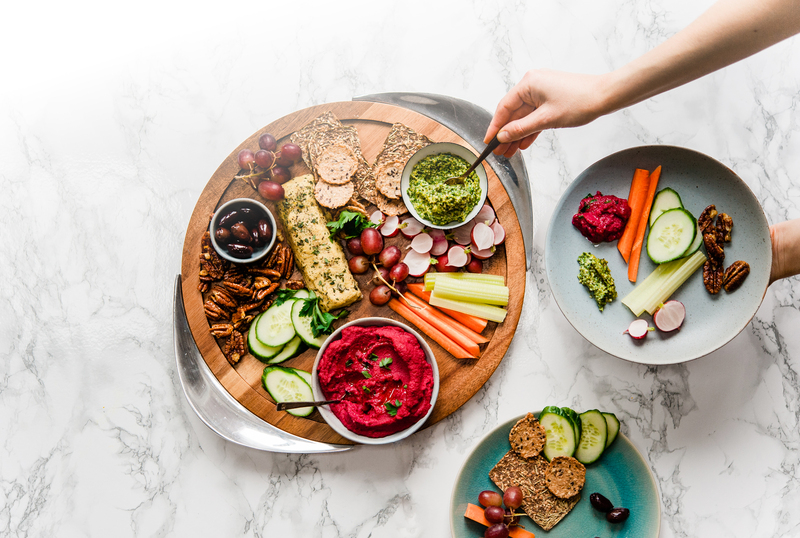 The board we’ve created features an assortment of gluten free crackers, vegetables and fruits and four recipes: earthy beet hummus, thyme and roasted garlic cashew cheese, radish green hemp pesto, and maple citrus candied nuts. Our recipes would be at home on any snack board, or are great as a stand alone option. Feel free to use them on your board, or keep these three tips in mind to build your own version. View the snack board as a canvas on which you can flex your creative muscles. Variety is the spice of life, or so the old saying goes, and it is essential when assembling a snack board. Choose not only a variety of items to place on your board – fresh produce, cheeses (or non-dairy options), meats, crackers, nuts, seeds, and spreads – but a variety of textures and flavours as well. Appeal to the 5 tastes by featuring a combination of savoury, salty, sweet, bitter, and sour items. You can add the crunch of raw vegetable crudités while featuring soft pickled ones, or a bevy of fresh fruits with a tangy fruit chutney. Build your board around items for a holiday, event, season, or a regional cuisine. Is it spring time? Load up your snack board with in-season items like fresh radishes, radish green pesto, and shaved asparagus. Is it summer? Break out the grill and feature loads of grilled in-season veggies like corn and bell peppers. Do you love Mediterranean food? Try beet hummus, marinated artichoke hearts, or harissa roasted chickpeas. When in doubt loading up your board with an assortment of brightly coloured fresh vegetables, herbs, and fruits is sure to appeal to our tendency toward eating with the eyes. They are not only packed with flavour, but fibre and phytochemicals that are beneficial for disease prevention. It’s a win-win situation. Beet hummus is a nice break from traditional hummus and lends a rich, earthy taste and a pop of colour to your board. We even experimented and used a bit of smoked tahini from Parallel Brothers in our hummus (local for you Toronto folks). 1. Combine all ingredients except the ice water in a high-speed blender or food processor, scraping down sides of bowl with a spatula if needed. While still running, drizzle in ice water until the hummus has a smooth, creamy consistency. 2. Garnish with a drizzle of olive oil and chopped herbs. If you buy radishes with the greens still attached, this hemp pesto is an incredible way to utilize them and avoid the compost bin. Yes, radish greens are edible! They tend to be incredibly sandy, so make sure to rinse thoroughly to clean off any grit. 1. Combine all ingredients in a small food processor until smooth, scraping down sides of bowl with a spatula if needed. Tip: If desired, you can add a ½ cup of basil to this recipe to get more of a traditional pesto taste. This is an excellent option to add to your board if you’re vegan or have lactose intolerance and are looking for something to fill the void of a traditional cheese. It is creamy, bright ,and herbaceous. The thyme can be swapped for other herbs if you’re looking for a different flavour profile for your board. Dill, chives, basil, or tarragon are all fantastic choices. 1. Soak cashews overnight in warm water, draining and rinsing thoroughly. If you’re in a time crunch, you can soak in hot water for an hour. 2. Combine soaked cashews and remaining ingredients in a food processor until completely smooth and spreadable, scraping as necessary with a spatula. 3. Using wet hands, you can optionally roll your cheese into a log or ball, placing on a small piece of parchment or wax paper. Otherwise, place in a bowl. 4. Sprinkle with remaining thyme and cracked black pepper. These crunchy clusters are the perfect balance of sweet with a bright hint of orange. Feel free to use pecans in this recipe or substitute for walnuts, almonds, or pistachios. 2. In a small saucepan over medium-low heat combine coconut oil, maple syrup, and orange zest. Add in pecans (or nuts of choice) and stir to coat. 3. Spread on a parchment lined baking sheet and bake for 13-15 minutes, checking on and stirring them periodically. 4. Allow to cool and serve. If you’re racking your brain for something to make for a dinner party or a potluck, this snack board is sure to be a show stopper! These four recipes are some of the things that we like to include, but we’d love to hear what your must-have snack board items are. Give us a shout in our comments section, or on our Facebook, Twitter, or Instagram pages.